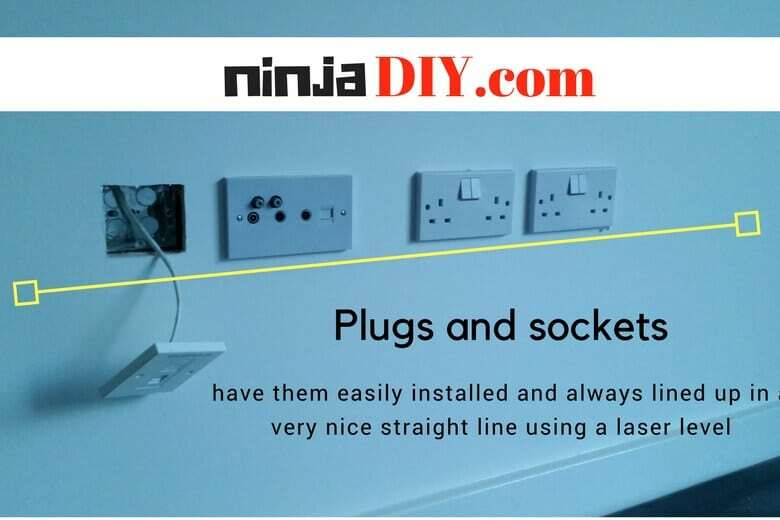 So if you are an electrician looking for a new tool or maybe just want to replace the one that you already have in your toolbox, you are in the right place. An AWESOME laser level for electricians. No wonder it’s so popular! Fully loaded with great features. It’s a Self-Leveling Cross-Line laser device that will help you be more productive and work faster. With over 500 reviews on Amazon, you definitely have to take a look at it … Click below to see more. 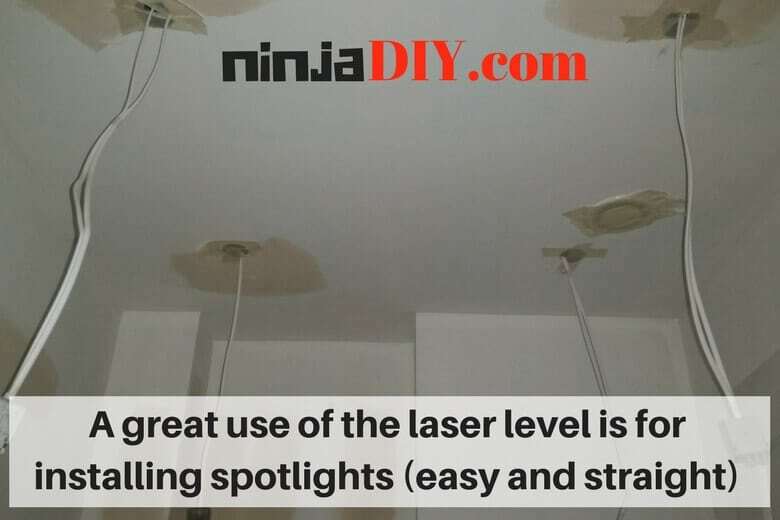 And … if you’re not in a hurry 🙂 … let me tell you that this reviews article is about four different laser levels that I consider to be the right laser level for electric works around the house or on professional construction sites. They have different features and applications; choose the one that is appropriate for your tasks. If you still need help to decide … drop me a message and I’ll do my best assist you with your doubts. 1 Why would you use a laser level in the first place? 2 What should you look for when buying a laser level for electricians? 2.2 2. Is it a self-leveling laser level? 2.3 3. And can it transfer a point from the floor to the ceiling? Why would you use a laser level in the first place? Laser levels are perhaps the single most important piece of equipment for construction workers. A laser level is an indispensable tool for electricians alongside a trusty measuring tape. 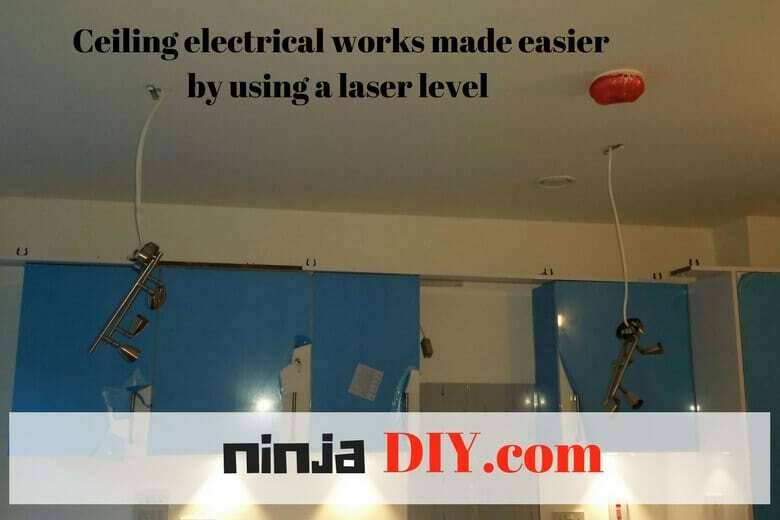 There are many tasks that you could use the laser level as an electrician, especially when you have to do a lot of ceiling works, installing lights, and other ceiling accessories. When drawing lines on the ceiling for installing down-lights or simple lights like the ones in the image below, for example, using laser levels will minimize the chances that errors in alignment will occur during wiring and other tasks associated with electrical work. What should you look for when buying a laser level for electricians? Nowadays, most of the top laser level brands out there, they have excellent products, and you can hardly make a big difference between their features. And each trade as well it can use a laser level in different ways for different purposes. Based on what I know and on what my electrician colleagues told me on site, here are a few points that you should have in mind before buying a laser level for this trade in particular. Of course, the main purpose of a laser level is to help you achieve precise measurements and for that, you need to check how accurate a laser level is. Some tools accuracy rating is 7 mm and others only 3 mm, the lower the “accuracy number” is … the more precise the laser is. So a laser level with 3mm accuracy at 9m it will be much better than a laser level with a 7mm accuracy at 9m. 2. Is it a self-leveling laser level? This could be a really nice feature to have. It makes the job extremely easy. Just switch the laser on, press the buttons to create your lines … job done. 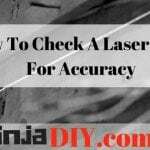 Whereas if your laser level isn’t self-leveling, you’ll have to lose a few minutes to adjust it and level it in the position that you need. And the worst is that you need to check every now and then if the tool has moved from its position and make sure you are working with the same level that you started with. Go for self-leveling laser level every time you can! 3. And can it transfer a point from the floor to the ceiling? Yes, one of the most used properties of a laser level for electricians is to transfer a point from the center of a room to the ceiling. Again, this is only for sparkies. This might not have too much use for other trades. But the more complete your leveling tool is … the better! I believe the points from above are some the most important things you need to look when you want to buy a laser level for electrical works. As always, when shopping for construction equipment, it is recommended to consult dealers and tool reviews for some useful insights. 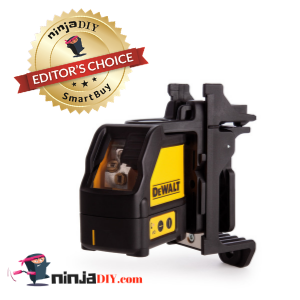 This is probably the best DeWalt laser level for electricians. 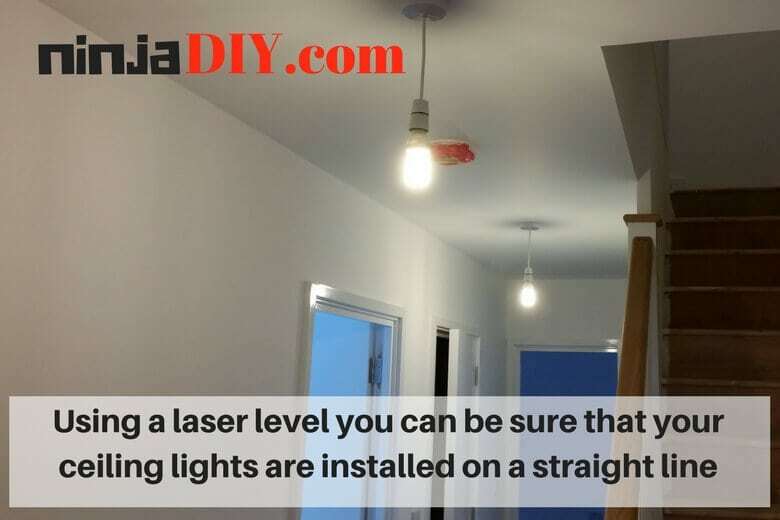 If you do a lot of ceiling works like installing downlights, for example, this laser level will make your life so much easier. Tons of great features for a professional like yourself. It’s a MUST tool to have in your toolbox! Read owners reviews on Amazon by clicking below! The DW088K is a fantastic piece of equipment capable of performing professional leveling tasks. This could be the perfect electrician laser tool. Designed and built by DeWalt; a world-leading brand in power tools and construction equipment, the DW088K’s quality is unmatched in its class. The device is most popular among professional electricians, carpenters, handyman, even tilers, most of these pros believe that this could be the best construction laser level. Hobbyists have also taken quite a liking for this little laser tool. The laser level is IP54 rated against dust and water. It will, therefore, provide a longer service life meaning you don’t have to worry about your equipment breaking down. It comes accompanied by a three-year manufacturer’s warranty and a years’ worth of free service. The DW088K operates on a class 2 laser with a power output of 1.3mW. The laser diode emits a red beam in full-time pulse mode which allows its use with detectors hence making it the ideal tool for both indoor and outdoor electrical work. The laser level boasts an integrated magnetic pivoting base that allows it to be mounted on any metallic surface. The DW088K produces bright crossing horizontal and vertical laser lines with an accuracy of 1/8 of an inch at 30 feet. According to my research and experience, the self-leveling feature built into this laser level model is popular with most electricians and DIY enthusiasts. However, this laser level doesn’t allow you to lock the laser beam in a set position, a feature that is observed in other competing models in its class. Many of my colleagues on site are using this laser level. It means it has the trust from construction and building PROS, so I would go for this one if I needed to buy a new laser level for my projects. ☛ I know everyone love to read other people experience with an item before they make a decision … so if you want to check what other users are saying about the DeWALT laser level on Amazon click here. If you want to get a full laser kit for less than 150 bucks, then this one it’s a good choice. Johnson, it’s been for years in the game and they do create quality leveling tools. I’m sure you do a lot of electrical fixture installations. This laser level will save you a lot of time. Just set it up and carry on with your electrical installation! DON’T BUY IT before reading few owner’s opinions on Amazon. Click below. The Johnson 40-0921 is built to handle leveling tasks both on a professional level and DIY too. The laser level comes in a kit that includes a hard carrying case, an extendable tripod, viewing glasses, and three triple-A size batteries. The product offers intuitive features that set it apart as the perfect laser level for electricians. The Johnson 40-0921 is self-leveling and is suited for both indoor and outdoor tasks. The red laser diodes used in these models produce a bright enough beam that is cross-linked. The tinted glasses allow the user to see the beam in outdoor lighting conditions. It has a 360-degree swiveling magnetic base that allows the laser to be mounted on any metallic surface and simply spin the laser level in place. This tool seems to have sparked quite a bit of interest, especially with electricians, plumbers, and carpenters thanks to its affordable pricing point. The features offered on this model are similar to what is offered in pricier competing models. Despite being affordable, the Johnson 40-0921 does not offer a wide-angle spread that is present in pricier models. The laser level projects a line that is only a mere 105-degrees, while the pricier competing models are capable of projecting a line that is between 150-degrees to 180-degrees. ☛ DIY Enthusiasts, handyman, and handy-women, as well as PROS, liked this laser level. And that is because you can get a good quality cross-line laser level at a decent price for light duty use. If you want to see other users reaction to this item on Amazon … click here. This one can be included in the “tools electricians use“ category! Any sparky should have one of these square laser devices in their toolbox. You should as well! Convenient, accurate, user-friendly, and very versatile. It will help you square, align and get the right 90º. See what other PROS are saying about using this simple but useful tool. Click below! The Bosch brand has made its mark in the construction industry by being the foremost manufacturer of high-quality power tools and equipment. The GTL2 Bosch level is a reflection of Bosch’s commitment to perfection, functionality, and simplicity. This small tool can assist you with some little jobs like the one that we did last week (in the picture below) installing some plugs and sockets in a new flat. I personally believe that having this little gadget in your toolbox it could help you a lot being very light, small and easy to use anywhere, not to mention that it’s not expensive at all. The unit projects a horizontal and a vertical inch chalk line thanks to a bright red light laser diode. The device comes with an alignment guide for a 90-degree layout. It makes calculation and turning of angles in easy 5-degree increments a walk in the park. The device has a simple one-button operation design. It projects two perpendicular laser lines; 90-degrees. It has an easy-to-press push button that makes securing the unit onto a smooth surface using non-abrasive adhesive possible. The product is a class II laser product, with a power output of less than or equal to mW of power. In our findings, what the consumers loved about this little unit is its accuracy. It performs as advertised with few if any glitches at all. A majority of professional and DIY electricians find the Bosch GTL2 laser square to be just the perfect tool for the job. They’re going to angles and areas where you won’t be able to set up your normal laser level. This is where this little piece of leveling tool comes into play. The only drawback to an otherwise ingenious product is the quality of the adhesive provided. There have been concerns about the adhesive’s inability to hold for a long time. ☛ Overall, users liked this little piece of kit. See more opinions about Bosch GTL 2 on Amazon Reviews. No more swinging plumb bobs ladies and gents 🙂 PLS3 it’s considered to be one of the best plumb laser levels for professionals. You can transfer a point from the floor to the ceiling by just pressing a button. Get this laser level and stop losing time. Get more productive. Make more money! Read reviews from PROS on Amazon. Click below! Leveling in electrical works is made even easier with this 3-Point Green Beam Laser Tool designed by Pacific Laser Systems. The device has green laser diode technology capable of projecting three visible laser beams that are estimated to be at least 300% brighter in intensity compared to red light laser beams. The green lasers make the PLS-60595 the perfect choice for both indoor and outdoor electrical work. Use your PLS 3 to determine reference points and lines down and up for each light, per dimension plans. How much time would it take you to lay out 50 lights in a vaulted ceiling with two people and a plumb bob? Install conduit, raceways, fixtures, and more. Before an electrical contractor can install light cans, fans or commercial lighting on the ceiling of a project, electricians must make sure that the layout is properly spaced as per the design. If the ceiling is vaulted or very high, they can measure out a grid pattern on the floor, and then transfer the points to the ceiling, assuring precise installation of the fixtures. So if what you need is a laser level for ceiling lights or a laser level for any kind of ceiling work … this might be the perfect tool for any sparky. The PLS-60595 is self-leveling and also incorporates a pendulum lock mechanism. The accuracy levels achieved on this model are at an impressive +/- ¼ inches for up to 100 feet. The unit has a 3-beam plumb and level point-to-point green laser beam alignment that allows you to layout the reference points even in the brightest of conditions indoors and outdoors as well. The PLS-60595 is built tough to give you a long service life. It is accompanied by a 3-year warranty and is the perfect electrical work tool. It has an inbuilt self-leveling mechanism that indicates an off-level state and an excellent compensational tilt angle. The PLS-60595 being a green laser level has a wider range compared to its red laser competitors. Electricians and other consumers, in general, seem to have noticed this and also the fact that it is suitable for outdoor projects, electrical or otherwise as the green laser is visible even in daylight conditions. One feature of the PLS-60595 that consumers are not happy about is the extensive use of plastic in the device’s casing. It raises serious durability and survivability concerns. If what you need it’s a laser level for ceiling work, then go for this PLS level. Although it’s made of plastic and that raises concerns this laser level it’s a very good bit of kit to have in your electrician toolbox, this one being excellent for you to transfer point from the floor to the ceiling and vice versa. Many liked this product overall. ☛ Do you want to see what users are saying about this one? Read Amazon Reviews here. In summary, laser levels are as important to electricians as are cable ties and wire cutters. Picking the right tool for the job takes some bit of searching, and with the right tool, you can be well on your way to making your next electrical project a smashing success. Any of the tools that we spoke about here today could be a good one for your job really, after all, we brought you here only tools that we use in our day to day jobs here on constructions sites. I always recommend using only “creme de la creme”, oh by the way here are our ratings for this tools based on our day to day experience. 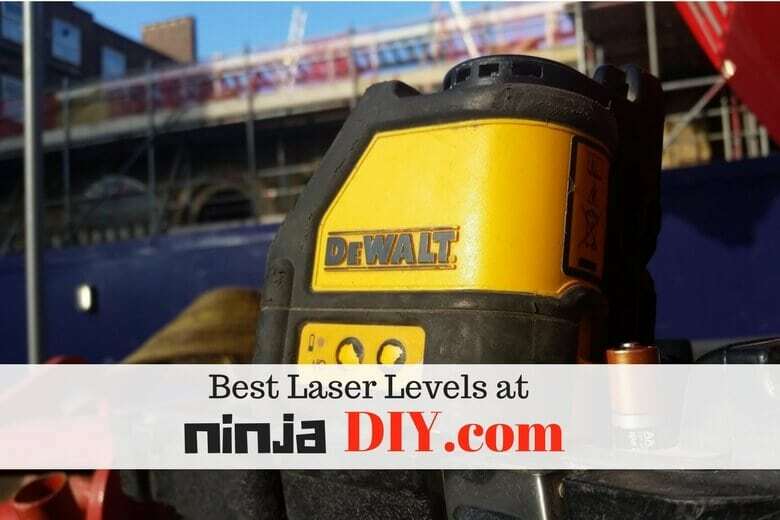 I believe that based on my experience, as well on what my colleagues on site have told me about their tools, I did recommended the best options for the sparkies, or at least guys (or girls) I’ve reduced the amount of search that you need to do in order to buy a laser level … to top 4 devices. Easy right? You simply can’t go wrong with any of the DeWalt laser levels 🙂 Top brand for Top professionals. Many colleagues in the construction industry like this laser level a lot. Especially because it can resist in a harsh environment like on a big site. It’s waterproof and debris resistant. Which means you’ll have the laser for a long time! Don’t forget to read OWNERS opinions on Amazon by clicking on the button below! Ok. This Is Great. Take Me To Amazon Now! 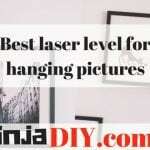 I hope that this guide has simplified your search for the best laser levels for electricians. If so, happy days, please leave a comment if you did find it helpful. And if you have another opinion, please bring it on by leaving a comment or contact me. I might even include it in the article if you would like to.